Possibly a controversial subject for most readers, this covers the IRA’s opponents at the Burning. But, as someone once said, it can be wise to know your enemies. 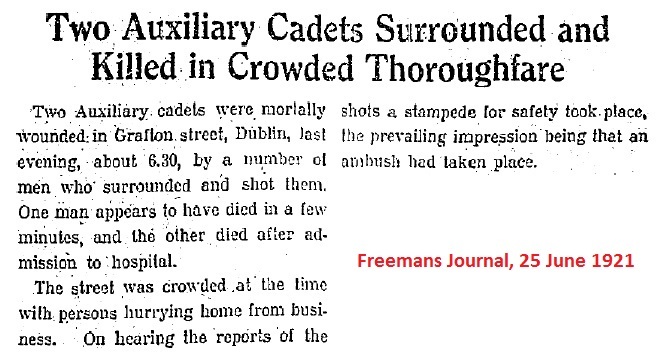 Hopefully the following gives some idea of what the lightly armed Dublin Brigade men faced that day in 1921. The first Crown forces to arrive at the scene were Auxy F Company from Dublin Castle, followed shortly by Q Company from the North Wall. Many believed the Auxies happened to pass the Custom House by chance and felt if the IRA pickets had held their fire things may have turned out differently that day…. However, two possible sources for a tip-off are recorded – DMP Det. Inspr. Alexander McCabe acting on information received by phone from an unnamed (Irish) civil servant; or an anonymous local DMP man cycling by. The IRA had cut telephone/telegraph links to the Custom House, so possibly some outside observer raised the alarm. We may never know who actually alerted the Castle but somebody definitely did. According to post-action reports by F Company officers, they received an urgency call (sic) from Dublin District HQ at 1310 hours (in the middle of their lunch). The word was that 100 armed men were holding up the Custom House. Three Crossley tenders and a Rolls Royce armoured car were rushed there and arrived at 1315. Then, said Lt. & 1st D.I. R. K. Caparn, O/C of Auxy F Company: “Just after passing under the Railway Bridge and drawing up, fire was opened on us from the Customs House and all around”. “As the first two tenders entered Beresford Place and were proceeding in the direction of the front entrance of the Customs House a heavy hail of fire was opened on them from the windows of the Customs House, the Railway line and the adjoining street corners. The tenders immediately halted to get into action and as the crew dismounted from the second tender bombs were thrown at them from the Railway line overhead. Six Cadets sustained casualties (sic) – two slight. (For anyone interested, there’s a brief note at end of this post on the Auxies, ranks, etc). The above understated the wounds suffered by some (By the way, the use of “Dangerous” was not a comment about how fierce Lewis was – it meant he was in a bad way). Apart from one, the Auxy casualties were English and by their own account all wounds were caused by the bomb thrown by Vol. Dan Head, KIA. The exception in both cases was Lewis. He was Welsh – and was also hit by a bullet after being blown out of his lorry. It is not our aim here to give bios for those men, but brief notes follow (some details from www.theauxiliaries.com – duly checked & added to!). 1) James J. Huntingford (1879-1946): ex Lt. Devonshire Regt., joined Sept 1920. Platoon commander, F Company. Leader of many raids for IRA arms & men in Dublin during 1921. 2) Harold R. Oliver (1889-1980): ex 2/Lt. Royal Garrison Artillery, joined Oct 1920. Blast injuries to both eyes. Awarded £450 compensation. Seems to have resumed duty later. 3) Gwilym H. Lewis (1895-? ): ex Lt. 6/London Regt., joined Oct 1920. Multiple shrapnel wounds & bullet though one arm. Discharged medically unfit, Nov 1921. Awarded £1,700 compensation. Possibly went to South Africa or Malaysia in 1922. 4) Arthur Loftus Gore Tottenham MM [Military Medal] (1874-1940): ex Major, New Zealand military, joined Aug 1920. From Auxy Depot. Fractured arm & leg. Discharged medically unfit, Nov 1921. Awarded £2,500 compensation (on appeal). Born in Co Leitrim to “Landed Gentry”, he had a very chequered career, e.g. was with K Company when they burned Cork city & was demoted as Intelligence Officer after a robbery elsewhere (For those reasons we might just do a future post on this “dodgy auxy”). 6) John A. Goold (1894-1982): ex Lt. RNVR, joined Dec 1920. 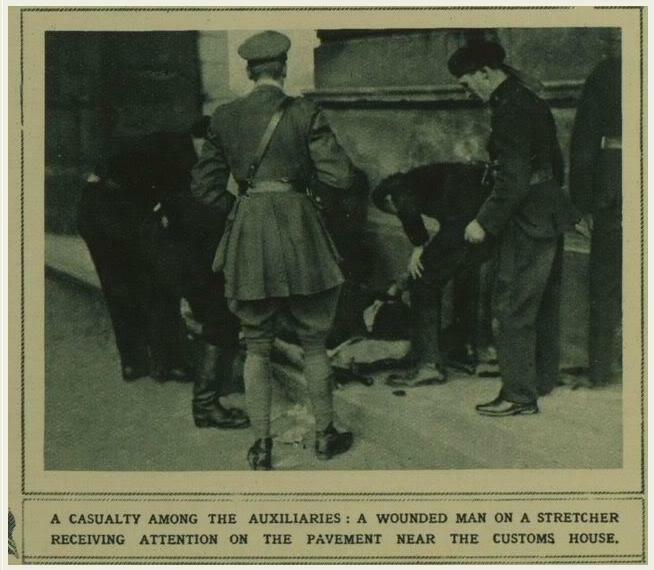 No further details of wounds but was admitted to KGV Military Hospital after the attack on the Custom House. Returned to duty a couple of months afterwards. So, at least three of them were put out of the fight in Ireland for good – but lived to advanced ages. S/L Leonard G. Appleford (1894-1921): ex 2/Lt., Machine Gun Corps, joined Sep 1920. One of the Auxies who “rescued” the Blue Ensign (British Customs & Excise flag) from the roof of the burning building. A month later, off-duty, he and another Auxy were shot dead on Grafton St. in broad daylight. T/C Richard Dentith (1896-1974): ex Lt. Inniskilling Fusiliers, joined Nov 1920. Previously wounded by the IRA in the Battle of Brunswick St, 14 March 1921. Features in several photos from 25 May & is labelled A in photo below. He is also in the “Cairo Gang” photo. T/C James Waddingham MC [Military Cross] (1883-1972): ex Capt. Artillery, joined Feb 1921. Labelled B in same pic. He appears carrying a rifle in many pictures from the attack on the Custom House. Courtesy of Peter McGoldrick. (An IRA intelligence copy labelled ‘Denteith’ X & ‘Waddington’ Y). 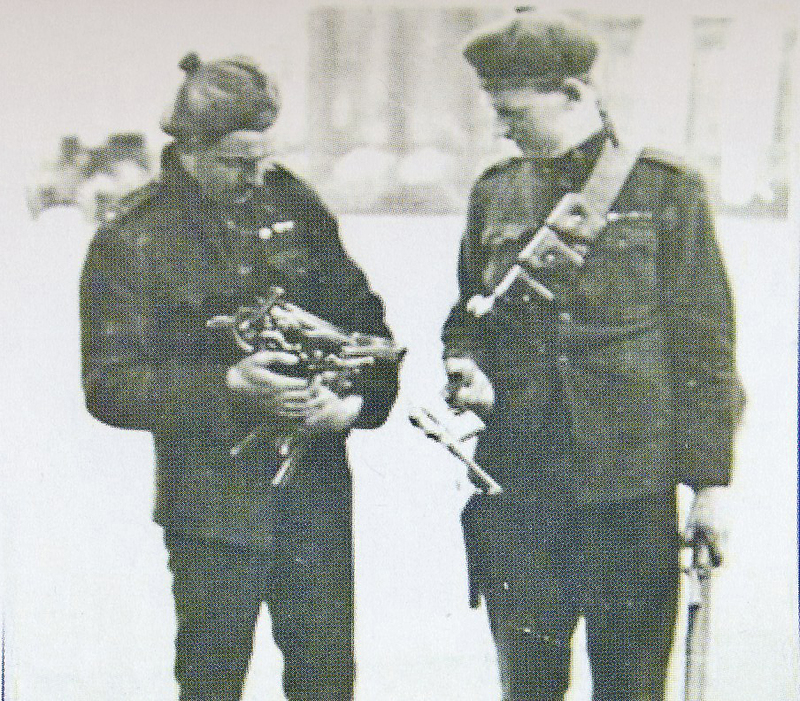 The Auxies used far heavier weaponry than the IRA that day – Lee Enfield rifles, machine guns in two armoured cars plus portable Lewis machine guns, shotguns and handguns. Auxies fatally shot 5 IRA and 1 civilian and wounded a dozen others during the Custom House battle. Most likely they also killed two other civilians caught in the wrong place at the wrong time. * Allegedly in possession of revolvers (The Auxies reported capturing 27 weapons). Sixteen of those men were sent to Mountjoy Jail & the two wounded men to KGV (now St Bricin’s) Military Hospital. The rest of the prisoners were taken away by the Wiltshire Regt. to Arbour Hill Detention Barracks and those determined to be IRA members were later sent to Kilmainham Jail. The Auxies were well chuffed with their actions on 25 May 1921. An expert has discovered one Auxy officer mentioned above received the highest police award, the Constabulary Medal, after the battle. While this would of course have been good for British propaganda and morale, it possibly also shows some recognition of the dangerous military capabilities of the Dublin Brigade. 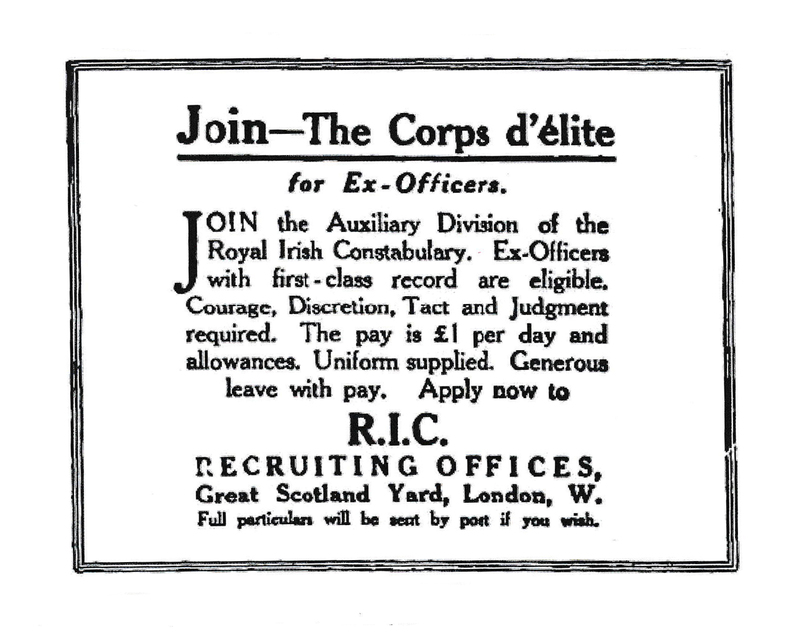 Auxiliary Division, Royal Irish Constabulary (ADRIC), the Auxies, were recruited from former British military officers with WWI experience. Devised and created in June 1920 by Churchill & others, they were thrown together with minimal police training. The good pay attracted many – some war-junkies seeking adventure and others unemployed & looking for work – to face “a rough and dangerous task”, as Lloyd George (British Prime Minister) termed his undeclared war on “the IRA/Sinn Féin terrorists” in Ireland. At any time there were about 1,500 serving Auxies. In all, just over 2,000 joined. They originated from over a dozen countries worldwide, but the vast majority were English. Some were Catholics. More than 170 were Irish born. Auxies were formed into Companies of about 100, lettered A-R (plus the mysterious S & Z). In effect they became a second semi-independent British army in the 26 counties (only a tiny number were based in the north) and quickly gained notoriety for violence – reprisals, torture, destruction of property, indiscriminate shooting and summary executions. Auxies are commonly termed Black & Tans – another disastrous knee-jerk response to the Irish situation by Britain – but had a separate command & organisation and were paid twice as much. Originally they wore their old military uniforms with a tam o’ shanter hat. They eventually had RIC dark green-blue uniforms; and a distinctive Balmoral bonnet with company badge with coloured flash on the side, a bobble on top & ribbons at the back. But they didn’t always fight in uniform….. (See F Company, below). All Auxies were heavily armed, with a wide selection of personal weapons, machine guns, plenty of ammo and transport for operations. There is a belief they were the dregs let loose from British jails. Not true, but many had been mentally scarred by the Great War. There was a higher than average suicide rate among them, according to one researcher. And some were convicted or sacked for ordinary crimes while in Ireland. One of their own, J. C. Reynolds of F Company (who sold secret information to Michael Collins’ intelligence service) said “some were very good and about 10% were bad eggs”. A few led lives of crime after leaving the Auxies. One expert has found 4 who’d been jailed before becoming Auxies. An example is the very same T/C Sparrow mentioned for arresting Vol. John Wilson at the Custom House in another post on this blog. Sparrow was banged up in 1913 for robbery in England. His excuse to the judge – he needed the money for betting! 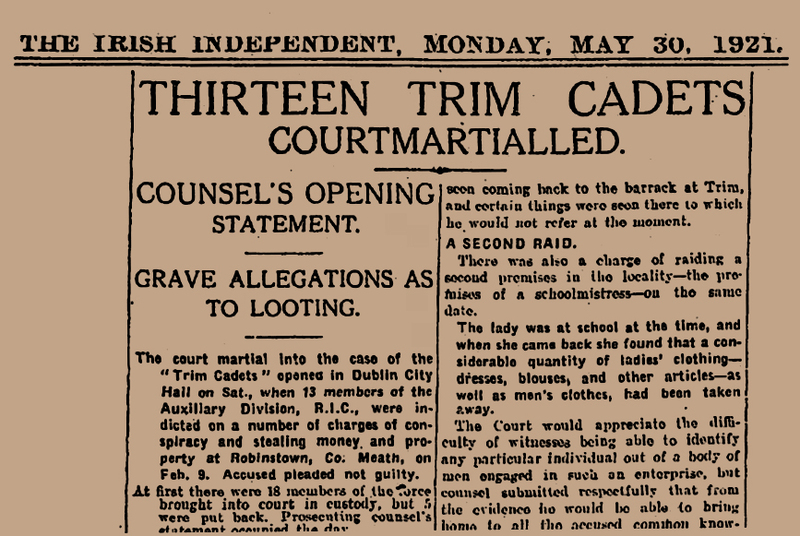 In a wider context, around the time the Custom House was burned newspaper headlines included the conviction of one Tan (Mitchell, later hanged) for a murder/robbery in Co Wicklow; and the white-wash court martial of 13 Auxies of N Company sacked for looting a loyalist’s wine & spirit business in Trim, Co Meath. Brig. Gen. Frank Crozier (first commander of the Auxy force) resigned when 8 accused were exonerated and re-instated. Auxies were called Temporary Cadets (ex-military officers) and Temporary Constables (ex-military NCO’s & other ranks as drivers, etc). They were graded in line with Old RIC ranks. 1st D.I. meant 1st Class District Inspector, 3rd D.I. was 3rd Class District Inspector, Section Leaders were equivalent to RIC Head Constables and Temp. Cadets to RIC Sergeants. Auxy officers also used their former military rank, e.g. Lieutenant & 3rd District Inspector. Over 400 Auxies (F, Q and 3 others rotating) were in Dublin at any one time. They also had a depot in Beggars Bush. F Company formed on 30 Jul 1920 and was permanently based in Dublin, with HQ at the Castle. They could call on armoured cars with military crews and for BA back-up as required (At the Custom House the Auxies were supported & replaced by the Wiltshire Regt.). During the WoI three of them were killed & 9 wounded by the IRA. F was closely associated with dark forces of the Crown in the Castle, including notorious figures like Capt. “Tiny” King, Capt. “Hoppy” Hardy and the Igoe or Murder Gang. They often went undercover in a deadly cat-and-mouse street war with the Dublin Brigade and were implicated in many notorious episodes in Dublin. The so-called “Cairo Gang” photo, at Dublin Castle. They were really F Company Auxies. No. 6 is Appleford, no. 1 is Dentith (face just visible) – both mentioned in the main post. Q Company, the “Ship Searchers”, formed in Feb 1921 and was located at major ports to stop arms smuggling. Members were seamen & ex-navy. Dublin HQ was at the North Wall Hotel, not far from the Custom House. It was attacked by 2nd Batt. on 11 April 1921. Later the Dublin Brigade killed one & seriously wounded another at the Mayfair Hotel. Michael Collins dismissed Q Company’s impact – “One of the old ‘G’ crowd (DMP detectives) would be worth 20 of them”. One researcher says fifty nine Auxies died in Ireland and 44 of those were killed by the IRA. This writer has counted 11 in Dublin. Over 100 were wounded in action, in accidents, by friendly fire, etc. The Auxies existed for less than 2 years but left an indelible mark on Irish memory. They were tough opponents for the IRA (See the book ‘Where Mountainy Men Have Sown‘ by by Micheal O Súilleabháin). The Spy in the Castle David Neligan thought “They were a thoroughly dangerous mob, far more intelligent than the Tans”. Unleashed with few controls, they had no worries about disciplinary action if they shot innocent people or IRA men “attempting to escape”. Their hated reputation was earned through their behaviour towards the general population, whether neutral, loyalist, nationalist or active IRA. Was anything good ever said about them by the Irish? Well, maybe once. It was acknowledged that during the court martial of Longford Brigade Comdt. Sean MacEoin, 3 Auxy survivors from the Clonfin ambush gave character evidence, testifying how well he’d treated them as wounded prisoners (He was still sentenced to death, the Truce saved him). The Auxies were withdrawn from this country by end Jan 1922 and all units disbanded. The Freemans Journal, tongue-in-cheek, wished the “Ogsies” a speedy trip home. Very few shed a tear over their exit. Unlike regular Tommies, they did not have many Irish girlfriends! Needless to say, they did not go quietly. Two companies mutinied, refusing to give up their arms and leave a ship in a Welsh port; & there were other disputes over pay, expenses, unpaid bills and pensions. Some went to Palestine to support the British mandate there. Britain eventually paid them all off at a higher price in sterling than planned. But Ireland incurred a far bigger cost through deaths and injuries; and economic woes from destruction of property & businesses, jobs lost and compensation paid. Credits http://irishconstabulary.com/ ; http://www.theauxiliaries.com/ (David Grant); books ‘Tudor’s Toughs’ & ‘The Auxies’ by Erne McCall; Irish Newspaper archives. And to Kind Reader Dermot Gunn who corrected my silly error about who’s who in The Cairo Gang pic….. The person marked 1 on the photo of the Cairo Gang is actually no 7. Number 1 (Dentith) is fourth from the right in the soft hat trying to hide behind the men in front of him. In 1914 Arthur Tottenham, a former RN and British Army officer, was living in New Zealand when he offered his services to the NZ Government at the outbreak of war. When New Zealand troops occupied German Samoa in 1914 he was appointed Provost Marshall. He curtailed the availability of liquor which made him thoroughly unpopular with the kiwi soldiers, and later got in to a public spate with the Post Master in Samoa. As a result of this he was sent back to New Zealand and his services dispensed with. His NZ military file on the New Zealand Archives ‘Archway’ site is extensive and make interesting reading. He later ended up as a Provost Marshall with the British Army in Rome until wars end. He was never awarded the Military Medal. One gets the impression he was a right martinet…. As we hinted, we do have a quite bit more info about that particular Irish-born Auxy. We might regard him as a spoiled landed brat and chancer who got away without paying his mess bill, more than a few times! As you say, he may also have been a stickler for discipline, but only on the part of others under his ‘command’…. If you’d like to share more about him or anyone else involved on 25 May 1921, we’d like that.